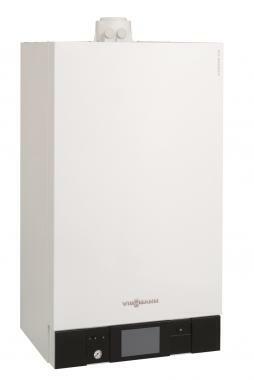 The Viessmann Vitodens 200-W combi boiler offers instant hot water heated directly from the mains and is a good choice for small to medium sized properties who either don't want or haven't got the space for a separate hot water cylinder. The Vitodens 200-W is heavier than similar combis boilers at 46kg and is too big to fit behind a standard kitchen cupboard (it measures 85x45x36cm) and requires 70cm clearance at the front for servicing. This boiler comes with a number of control options and you can opt for a constant temperature controller (Vitotronic 100) or a weather-compensated controller (Vitotronic 200 both come with a 7 day timer. External control should be considered to maximise your boilers efficiency your installer will advise on what options are best for your property.